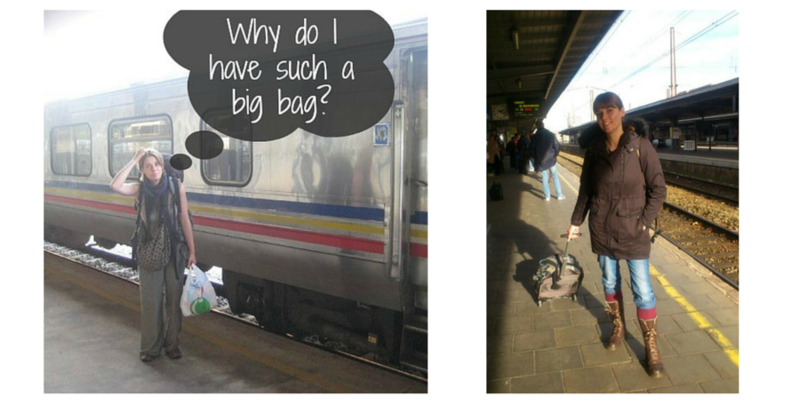 I learnt my lesson a few years back: pack light, travel happy! I’ve gone into more detail about the whys and hows in my previous post reviewing my well-used, well-loved Osprey Ozone 36 wheeled pack, but basically: the smaller the bag, the easier and less stressful travel becomes. 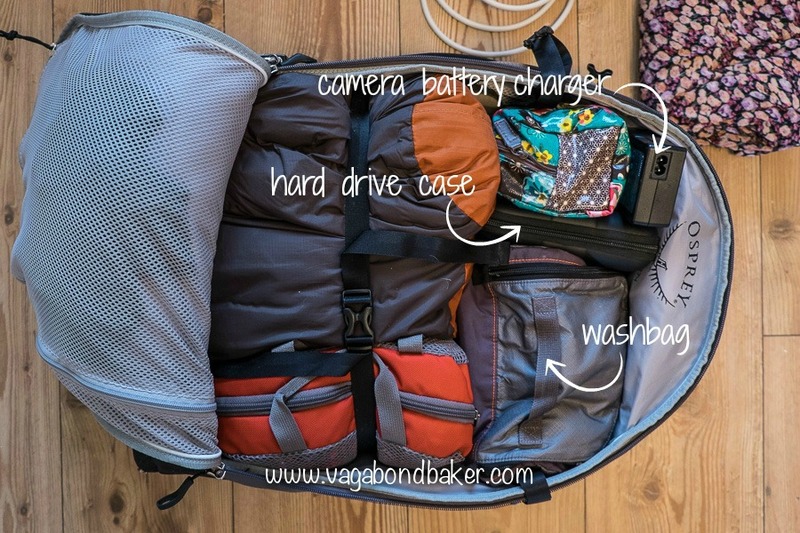 This is especially true if you also have to lug around a big DSLR camera or other travel-necessary technology, I just can’t be doing with the challenge of masses of heavy luggage and heavy gadgets. I travel with a Canon 5D II plus one heavy lens and a light 50mm, plus a slim, small laptop (although I have just downsized to a Fuji X-T1 camera but I’ve yet to travel with it *excited*). That camera/lens combo is weighty and after one trip to France and Switzerland in 2012 with my old 65L backpack, I soon learnt that I never, ever wanted to travel with such a big backpack again. It was a major pain in the backside: one huge, heavy pack on my back and a heavy camera bag strapped to my front, dashing through the Paris metro at rush hour like a dazed rhinoceros. I’d used the 65L pack on a 14 month RTW trip in 2008/9, and I’d struggled: I only had a tiny point-and-shoot camera for that adventure yet even then the pack was unwieldy and Chris had to help me with it on numerous occasions. For the trip in Autumn 2013 where we took the train to South East Asia via Russia, Mongolia and China, I switched to a much smaller 40 litre bag: the excellent Osprey Farpoint 40. This carry-on sized backpack forced me to rethink my packing and it revolutionised it. I went one step further last November and purchased the wheeled version, the Osprey Ozone 36. This super lightweight wheeled bag gave me even less room for stuff at only 36 litres but by this point I was a pro at packing light. It was perfect for a solo, rail-based adventure in Europe. I can tell you now how much easier it is to travel with such as small bag, I swear there were things in the 65L pack that I didn’t wear or didn’t need, and I’ve proved it by travelling from a wintery Siberia to hot, humid, South East Asia with a carry on bag. I got many envious comments from girls in dorms about how they wished their bag was that small! 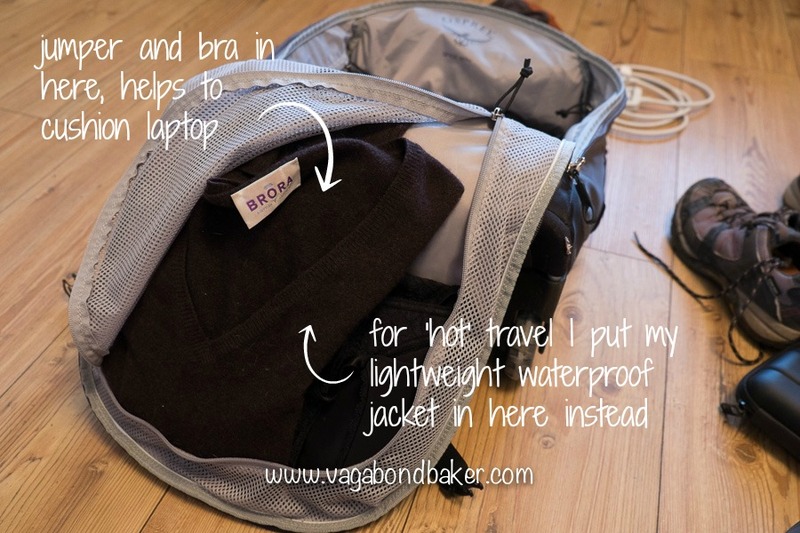 How to Pack Light: Here is what I pack and how I pack it. In the bag in this post is what I took on my 2 month trip to Nordic Europe in November and December, i.e. cold weather gear, and I’ve been living out of the bag for the past two months after returning to the UK since we’ve been restricted to train travel until we get a new van-home (I’m carrying some heels in my camera bag now though, a girl’s got to be prepared!). I pack my clothes into stuff sacks and cubes, I like keeping everything sorted and easy to access. The stuff sacks, into which I pack my undies and trousers/skirts, came from Rohan and the red handled ‘cube’ actually came out of Chris’s fancy camera bag: I found it perfect for tees and tops! Underneath the underwear stuff sack is a pair of trainers, in the rest of the main space I keep my toiletries in a small, ultra-light wash bag by Lifeventure. My make up is in a cute make up bag from Paperchase and around that I squeeze in a hard-drive case with my portable hard drive (I sometimes carry this in my camera bag), the annoying to pack but useful long extension to my laptop charger and the bulky block that is my camera battery charger. 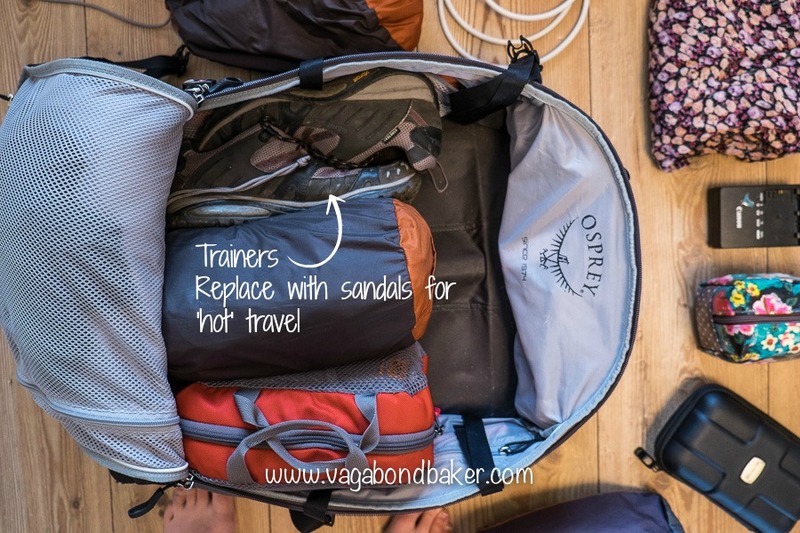 The trainers take up valuable space, and I would normally wear them to travel in and pack sandals or pumps in that space but for this potentially snow-filled trip I wanted to take my big boots so the trainers had to go in here. I usually wrap them in a plastic bag to keep everything else clean. Inside the packing cube I fold the tops and tees (I’m a folding ninja after a decade of working in clothing retail), I like the filing system approach: I can see exactly what’s in there. The trousers and skirts in the stuff sack are rolled which keeps them neat and easy to take in and out. So, what do I actually pack? Well, it depends on the season and the destination, what I’ve listed here is one for a ‘hot’ trips and one for ‘cold’ trips. Other than that it’s pretty universal unless you need specific technical clothing for sports such as skiing. 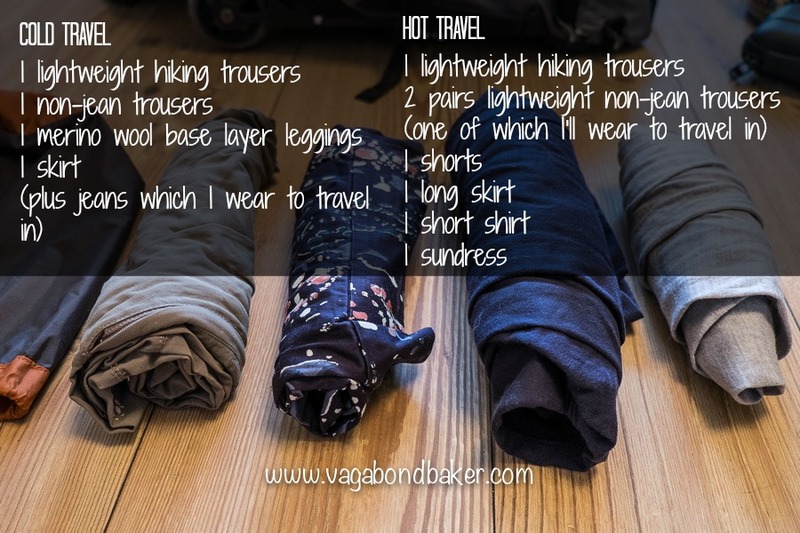 If I do a trip which involves both hot and cold destinations I mix and match between the two lists, good quality thermal layers transform light clothing into cold weather suitable gear: this was my technique for the Siberia to S E Asia trip and it worked great. When packing this light, you have to make considered choices into what you take. Multi-functional clothes such as thermal base layers and lightweight clothes that also don’t crease badly. You have to create a compact ‘capsule wardrobe‘ where everything can be worn with everything else. If one thing can only be worn with one other thing then it’s taking up valuable space and giving you far less outfit combinations. I don’t ever take jeans to hot destinations as they immediately get relegated to the bag as it’s too hot to wear them. They are too bulky and heavy. I wear them to cold destinations as I can wear them to travel in. For jumpers I much prefer cashmere, it is light as air and packs really small, it also looks great on and is very cosy. You can buy cashmere amazingly cheap these days, even in the supermarket clothing ranges, often for less than £40. I’ve bought great cashmere jumpers in the sales, and from Ebay, and I’ve never spent more than 40 quid; cashmere is the best type of travel knitwear (and also makes you very huggable!). For thermal wear, I love Icebreaker, this New Zealand brand makes awesome merino wool thermal base layers. Yes, they’re a little on the pricey side, but damn they’re worth it: they pack small and are super toasty. 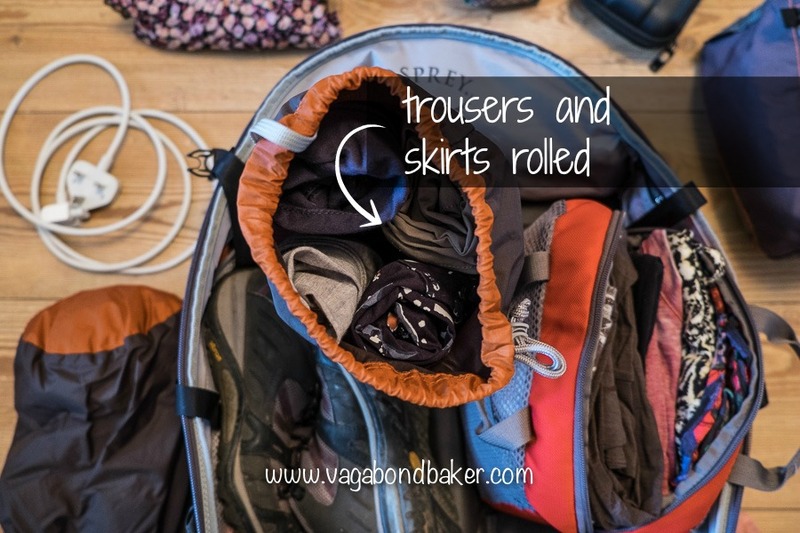 They are also breathable and naturally odour resistant and can be worn for a long time before needing washed, which is mighty useful for travelling! From Siberia to camping in Scotland in winter, these merino wool layers have kept me warm and comfortable, transforming ‘regular’ clothes into winter-proof gear. 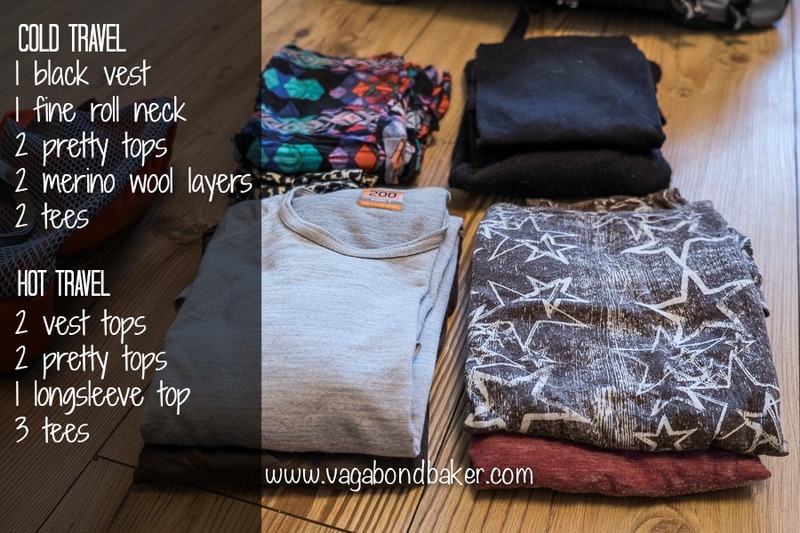 I didn’t pack a shirt on this last trip and I wished I had, great for layering. Basically the same as above but I ditch the thermal and a jumper, replacing them with an extra tee and an extra vest top. I still take one cashmere jumper as buses and planes can be fiercely air-conditioned. plus jeans which I wear to travel in, saving me having to pack them. By taking base layer leggings, you can wear any light weight trousers or leggings over them and be warm, I lived in mine in Scandinavia. If you don’t do a lot of walking then you could replace the hiking trousers with another pair of non-jean trousers or leggings. My hiking trousers are by Jack Wolfskin, they are very light, they roll up small, and they’re very comfortable. Obviously, work this list for your style, if you don’t need hiking gear or wear more dresses than trousers, switch them about. If you are heading to South East Asia you can buy cheap, backpacker-style, floaty trousers that are perfect for temple-visiting, humid city exploring and lounging on trains and buses in. I think on the last trip I had about 7 pairs of socks in all. For walking or winter socks I love Smartwool brand, their merino wool socks are super comfortable and warm. They’re expensive compared to regular socks so I only have two pairs. Long socks take up space so I pack them wherever I have room, in the side pockets of my pack or rolled into my trainers. The merino wool buff is cosy for winter travel and a great multi-use product for any season travel. I’ve used it as a face shield when riding a motorbike, as a neck warmer and even as an ear-warming head band. My beloved green pashmina goes absolutely everywhere with me, it’s getting a little faded these days, I bought it in Pushkar, India, in 2008! It is brilliant for covering my head in mosques, or my shoulders in temples, it smartens up an outfit, shades me from the sun and dust and I’ve even used it as a beach towel. If I’m solely doing cold weather travel then I will take a warm coat (wearing it while travelling) and no waterproof coat. For combination season travel I have posted the coat home or onward in the past. On the Trans-siberian/SE Asia trip I didn’t take a coat and relied on a fuzzy fleece jacket – that I carried for the rest of the trip tied to my backpack along – with my waterproof to wear on top. 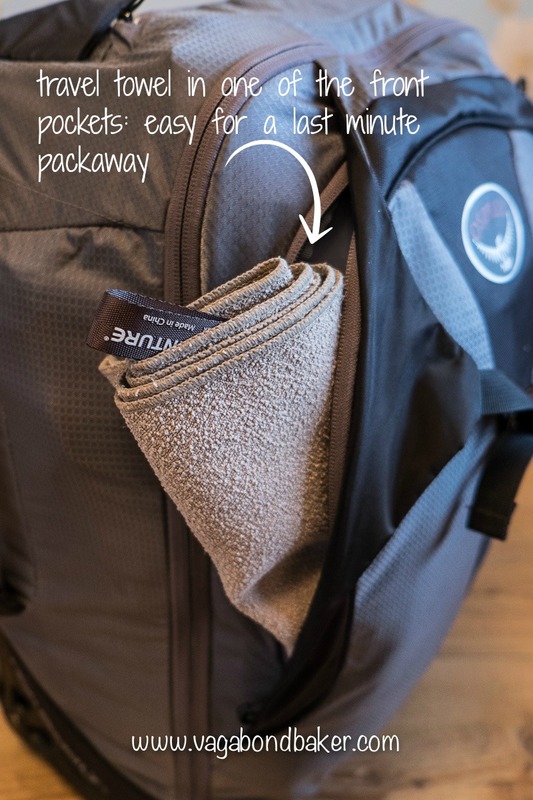 So, travel towels: to pack or not to pack? I have previously despised travel towels, pointless things that move water around you rather than absorbing it. I do like to have a towel with me though, I’ve travelled with a super-thin regular towel (that I bought in a supermarket in Japan) in the past but had to ditch it eventually as it was full of holes. It is surprising how many places don’t supply towels, and the towels in the hostels in Russia/ Mongolia seemed to be only slightly larger than bar mats. I have changed my mind to the travel towels though, I bought a Lifeventure Trek Towel for my last trip and was impressed with it. It feels much more like a regular towel than the usually ‘smooth’ travel towels and it was fine to use, and use it I did: a lot, from saunas to showers! It’s totally up to you, I personally like to have the back up option and it suits my travel style but if you stay in hotels then there is absolutely no need. Lush solid shampoo: I love this product, it packs tiny in its little tin, rinses out of my hair quickly and is great for hand washing (I hand wash my undies, to extend time between laundry, and my cashmere, wringing them semi-dry in a towel). Mooncup: my most precious belonging after my passport. In short, I am in awe of this product. Aside from the environmentally-friendly awesomeness of the Mooncup, it is so wonderful not to have to carry, or hunt down, sanitary products when travelling. My mooncup takes up no room in my wash bag and is far more comfortable, and safer to use, than tampons. I’ll maybe write another post on how I pack my wash bag (which also contains a rudimentary first aid kit). Living in such a small selection of clothes, if you’ve been used to a vast wardrobe, can be hard to get used to but I found I soon got into a different frame of mind. Plus, you are always moving on and meeting new people, so no one really notices anyway! It’s all about cleverly selecting clothes that can be mixed and matched with each other. It might mean doing laundry a little more often than you would with a massive pack of clothes, but who wants to be lugging round a heavy heap of stinking, unwashed, sweaty clothes anyway? I’ve no room for a hairdryer, or straighteners for that matter! My only hair styling kit is a comb, hairbands, pins, and dry shampoo if I have room for it. Hostels usually have hairdryers or I let my hair dry naturally, ah the bohemian wave. No heels, my sandals have to do double work for day and night. Well, I hope I’ve covered everything and I hope I inspire you to pack light. I certainly won’t go back to monstrous luggage! I know I my gear might sound expensive – cashmere, Icebreaker thermals, Jack Wolfskin trousers – but I’ve generally brought stuff in the sales and these products are great quality, they last well and wear well. I think the investment is well worth it: I shop on a tight budget! Disclaimer: None of the companies mentioned have contacted me, paid me or requested me mention them. All thoughts are entirely my own and judged by plenty of use! 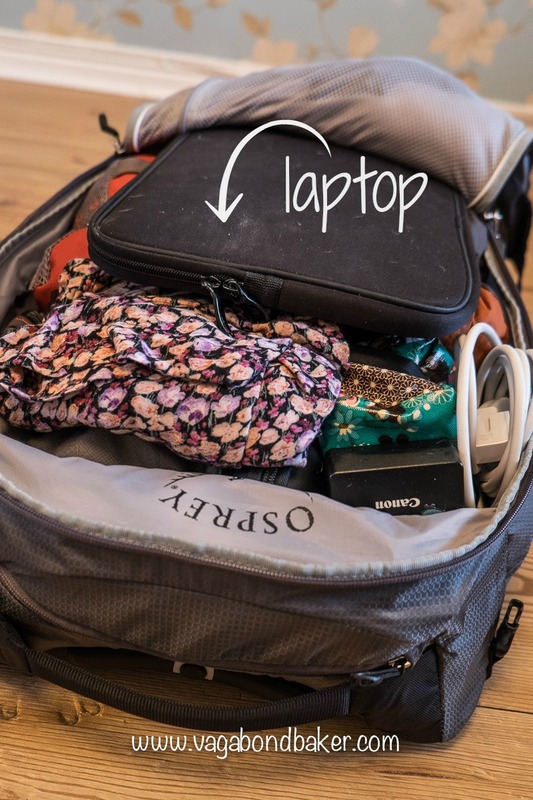 What tips do you have for packing light? Would you consider it for future adventures? I wish I could use dry shampoo! My unruly, curly hair loves to get frizzy and I haven’t found a good solution to packing light on the hair care products (I can’t use hotel shampoos unless I want to look like a poodle which I generally don’t). Aw! Grease is my demon! That’s a shame, I’m afraid I can’t offer any advice or any products. My fella’s goes poodley but his solution is to rarely wash it, and I’m pretty sure that’s not a solution you’re going to want! Wow, you really have got packing light down to a fine art! I will have to take some tips from this before my next trip. I’m getting better but my main problem is that I get so cold, I always end up taking loads of layers! I might also have to try the Lush shampoo again too, I bought it for one trip but felt like it didn’t lather very well – so wasn’t sure whether it was washing my hair or not! Oh, which Lush shampoo did you get, mine always lather great. I only really know them by colour: I love the purple one. They yellow one with conditioner ‘bit’s doesn’t last as long and the new pink argon one smells great but it crumbled into a million grains in my bag as I didn’t put it straight into a tin so using it has been messy! I don’t use liquid shampoo, I haven’t since discovering the bars in 06! Maybe liquid lathers up more, I can’t remember! I let you try mine at the weekend if you like! I am always permanently cold, I have terrible circulation. That’s why I love the merino layers, at one point in Mongolia I was pretty much wearing every layer I had: thermal base, merino long-sleeved top, 2 tees and my cashmere jumper! Cosy! Really need to try and pack lite but i always take bunch of stuff i don’t use/wear. Rhys has one of those towels, very towel like. The feel of it gives me the shivers tho, dont know why, he says im just weird. I’ve had to settle for one of those chamois leather types, while he dies himself smugly. What I usually do I pull out a collection of clothes, go through them: matching them up, discarding anything that a) creases/needs ironing before wear b) doesn’t match much else. Then I selectively pack it, favourites/practicals first and anything that doesn’t fit gets left behind! Ditch the chamois, it’s not worth the annoyance! Go invest in one like Rhys’s! So true, Rachel. I’ve come to realize that packing light is the best way to travel, and now I hardly ever pack more than a small carry-on and handbag (for my camera, wallet and phone). And the best part is that I don’t have to check a bag at the airport – which saves so much time before and after a flight. I rarely fly, but you are right: carry on is the way forward, plus you don’t have to worry about your bag being thrown about in the hold. I ended up checking in my 40L for flights when we were in SE Asia, mainly because my camera bag was so weighty I couldn’t really carry on both, I’m hoping that with my new, smaller camera set up this will be much easier. Glad to be of assistance! Yes, quality over quantity! 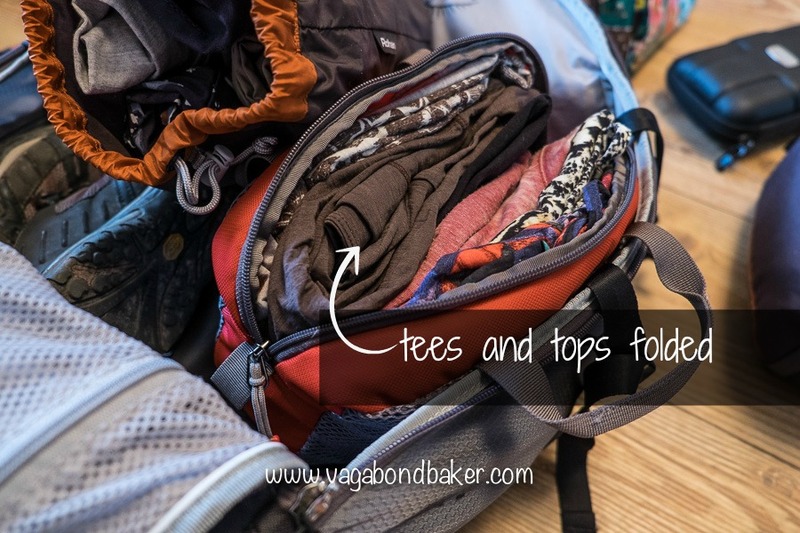 I do get a few inexpensive sun tops and the such like but for jeans and more technical stuff I’d rather have things that fit well and will last (as well as take my lifestyle!). I feel I live in my Icebreaker stuff! Although I have just found an awesome ‘active’ top in Fat Face new active range, it’s great and has breathable panels (and thumb holes), I’m sure it is going to make an excellent layering top for warmer travel and it packs down to nothing. I’ve been using Lush shampoo bars pretty much exclusively since 2006! Love ’em! I’d love to see you one day, meet up again! Great post! 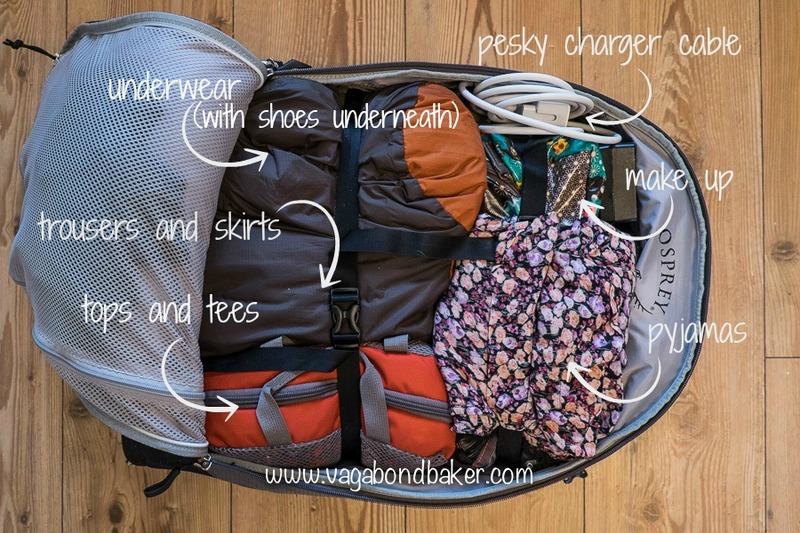 I hate travelling with a huge bag, and I’ve got it covered for trips of up to about a month long. I never travel anywhere with a bag that won’t fit go as cabin baggage. For our last big trip through, we ended up using Andy’s massive 80L bag which he bought years and years ago on his first trip around Europe. Partly because we didn’t have another bag in decent condition, partly because we got a little bit panicked about the cross season travelling involved. Most of my stuff was used, although Andy ended up carrying around several pairs of shorts he never wore! Luckily that bag fell apart completely by the end of the trip, and now we need to buy something new. I’m looking for something a lot smaller and a lot more practical for packing purposes. I’ll be looking into the bags you’ve suggested, they look so much more efficient for packing, it looks like you can actually find things without emptying the entire bag onto a dusty hostel floor. More than one item has been lost this way in the past! I love the look of those travel towels too. I always travel with one, but I hate using it. It feels like drying with a chamois leather – urgh!! I would love a travel towel that actually feels a little bit more like a real towel! Oh dear, it fell apart! Well, that’s a perfect excuse to scale down! I know what you mean about having to pull everything out to get something from the bottom, something I hated! My original 65L pack was a top-loading pack and I am a total convert to the clam shell type now, so much easier! Perfect description: a chamois leather! Urgh! This one I’ve had is much better and more like the real thing. I’d definitely recommend the Osprey Farpoint range, I have the smallest one: the 40L but you can get a slightly bigger one with a detachable day pack. I used mine for 9 months and it still looks virtually brand new!